We now have a Facebook page to go along with this blog. Please follow us - The Happy Travelling Family on Facebook. You'll find links to our blog posts on our Facebook page as well as other bits and pieces along the way. 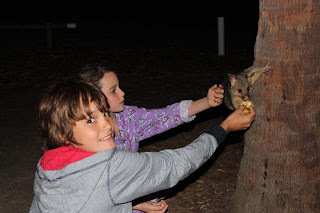 Today is this picture of Nathan and Emma hand feeding possums in 1770.